Mickyla Jackson is a born and raised Oregonian. She currently resides in Portland, Oregon with her husband Tim, and their three children; Serenity (4), Rosalind (2), and Augustine (3 months). Mickyla co-owns the blog Created Makers and designs her own crochet patterns for her business Mickyla the Maker. Mickyla has been crocheting for two years and has recently learned how to knit and weave as well. She has published 11 crochet patterns and counting that can be found on her blog Created Makers, on Etsy, and on Ravelry. I designed my first pattern, The Lady Jackson Beanie about six months later! It was so thrilling to design the pattern that I kept at the process, designing just about as quickly as ideas came into my head. I love the process of designing because it presents such a unique challenge to me. I never really considered myself an “artist” until I found yarn and a hook. From there, the possibilities were endless. 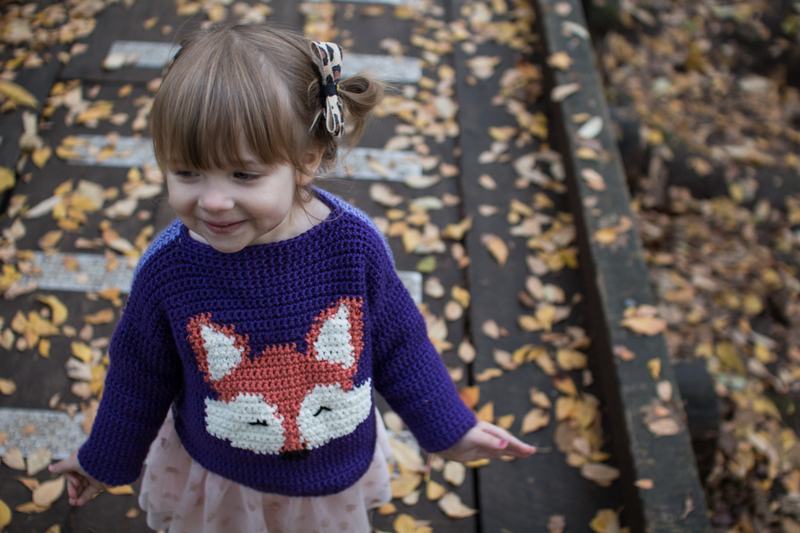 This brings us to this pattern, The Woodland Fox Pullover. This pattern uses tapestry crochet techniques, which has become my all time favorite form of crochet. I love that I can sketch a design out on a graph and then make it come to life in my hands. This design was originally inspired by the arrival of my son, Augustine. 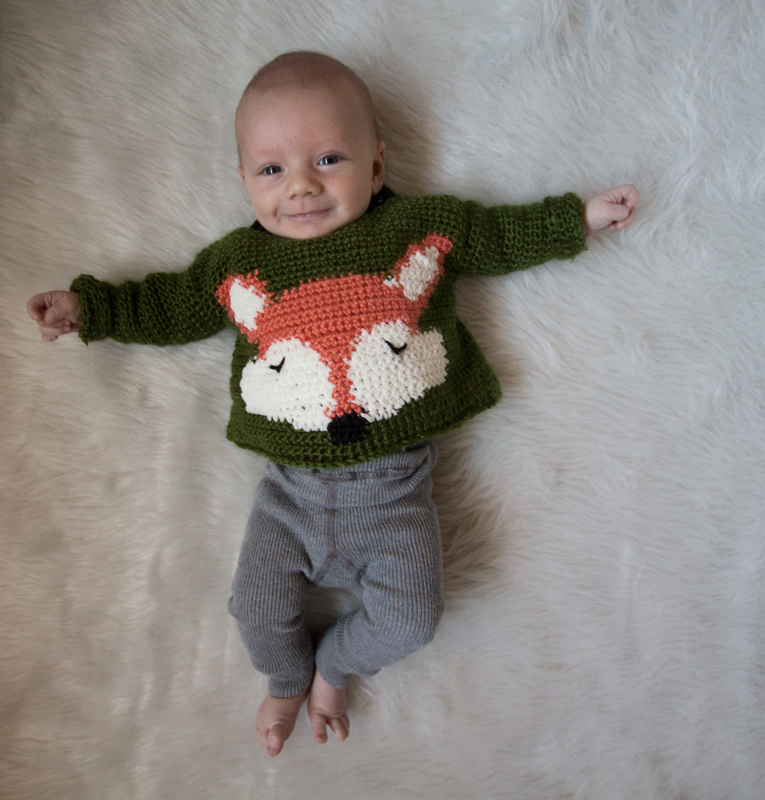 I was obsessed with all things fox when I was decorating his nursery and collecting my hoards of baby clothes. I started to imagine a cozy, green pullover sweater with a fox on it and when I couldn’t find anything like it at my local stores, I took the leap and sketched out the design myself! 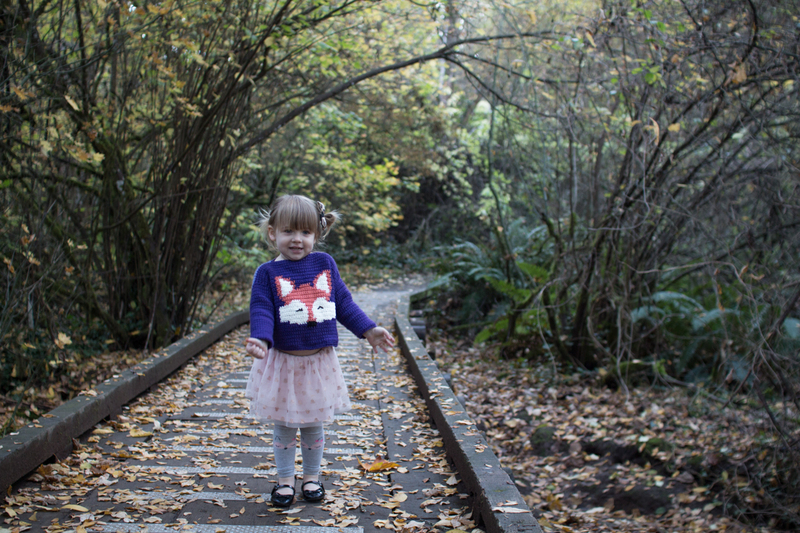 When I finished the sweater, my post-partum emotions exploded everywhere and I started bawling (of course). I have since collected myself and readied this pattern for your hands! Lets get making!! 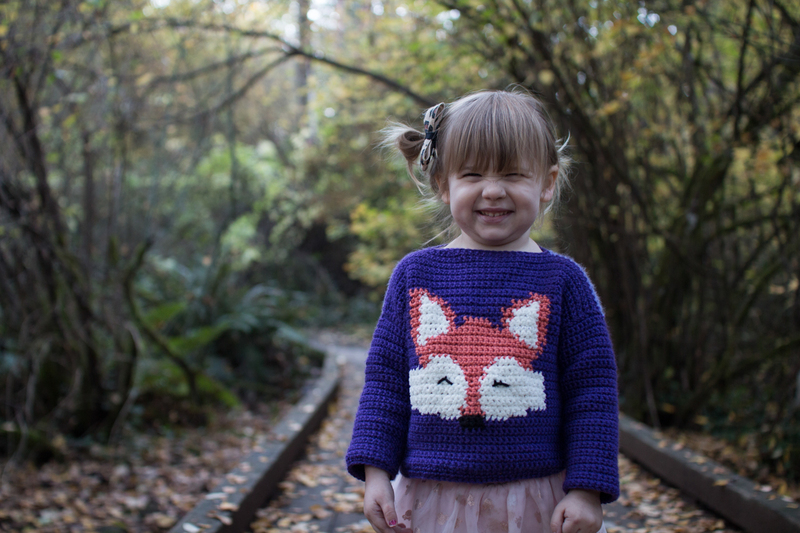 I am so incredibly excited to be releasing the Woodland Fox Pullover into your hands! 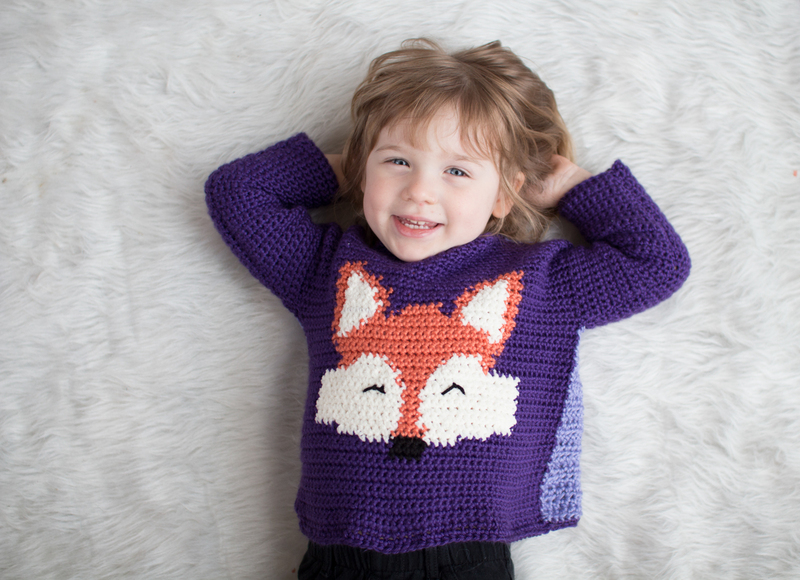 This pattern is written up for sizes 3-6 months, 6-9 months, 12 months, 2T, 4T, and 6 years. Also, good news; this sweater is composed almost entirely of single crochet, so it is very beginner friendly as well as quick! 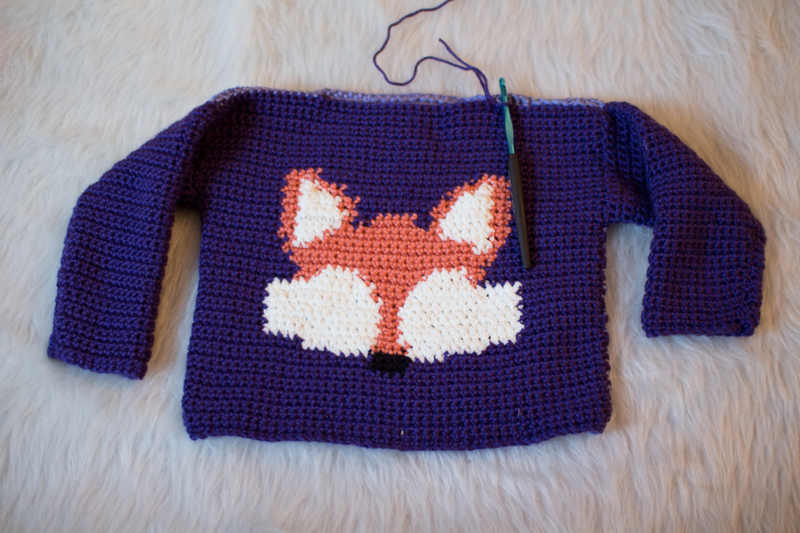 Lets get down to making this awesome sweater; I can’t wait to see your finished projects! 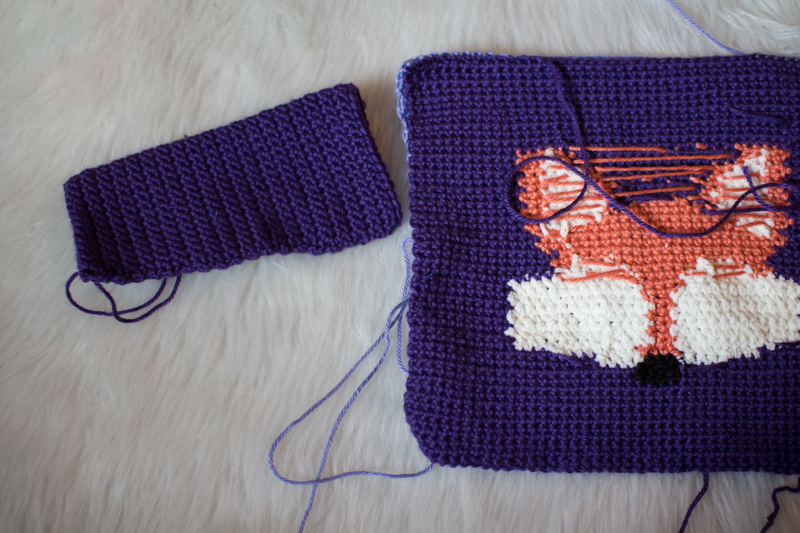 -- 100 yards of white (I used Bernat Baby Blanket Tiny to add texture to the Fox. Clarification photos can be found at the end of this document. Stitch counts are noted at the end of rows. The count will be found in parenthesis. Example: Row 1: SC across (18). “18” is the stitch count for this row. This Pattern is worked in 4 separate pieces; the front panel, the back panel, and two sleeves. The chain 1 at the beginning of the row does not count as a stitch. Sizes are written in parenthesis in the following order: (3-6 months, 6-9 months, 12 months, 2T, 4T, 6). 4inch by 4inch square: 16 stitches X 22 rows of single crochet. Row 3-? : Repeat Row 2 (4, 6, 8, 14, 18, 22) times. Count (6, 8, 9, 10, 14, 18) in from both the right and the left sides of your sweater. Mark the stitch you count to. (for example, if you are counting to the 6th stitch, mark the 6th stitch, not the 7th. Once you have marked both stitches, count the stitches in between your stitch markers. You should have 28 stitches. These 28 stitches will make up the fox face. Row 1-? : SC across your row (10, 12, 16, 14, 16, 20) more times. Row 3-? : Repeat Row 2 (42, 46, 52, 56, 62, 70) times. 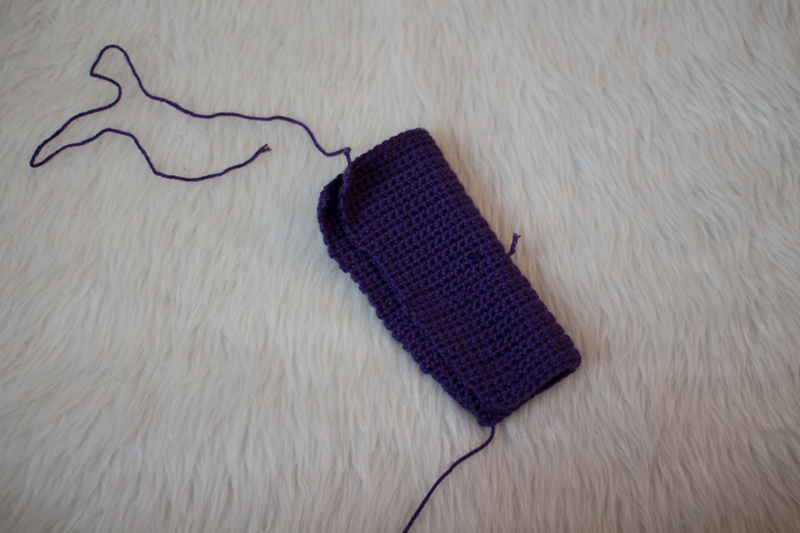 Row 2: CH 1, Turn, 2 SC into first stitch, SC across the row until the last stitch. Place 2 SC into the last stitch. (20, 22, 24, 27, 30, 33). Row 3: CH 1, Turn, SC across your row (20, 22, 24, 27, 30, 33). Row 4: CH 1, Turn, SC across your row (20, 22, 24, 27, 30, 33). Row 5: CH 1, Turn, SC across your row (20, 22, 24, 27, 30, 33). Row 6: CH 1, Turn, SC across your row (20, 22, 24, 27, 30, 33). Row 7: CH 1, Turn, SC across your row (20, 22, 24, 27, 30, 33). Lay your front panel right side up. Lay your back panel right side up directly on top of your front panel. Seam up the remaining gap on the front and back panels. -- Attach yarn in the corner of your sweater along the neckline. -- SC around the neckline, working in a clockwise circle. Slip stitch to your first stitch when you come around. -- SC around once more, placing one SC in each stitch. Congratulations! You have completed your sweater!! Thank you so much for spending your valuable time with this pattern, it is truly an honor to bring this pattern for you all to enjoy. 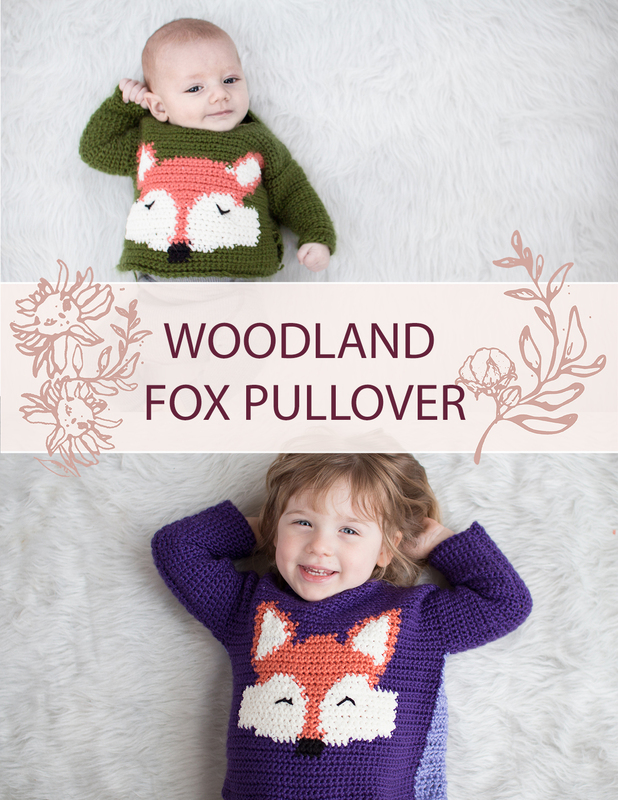 If you want to share your makes with me on Instagram, please use #woodlandfoxpullover and tag me @mickylathemaker so I can see your lovely sweaters! That’s all folks!